Meet and transfer to your hotel where you have the rest of the day free to enjoy the 'Garden City', gateway to the Southern Alps and filled with tree-lined avenues, leafy parks and the Avon River winding through its centre. 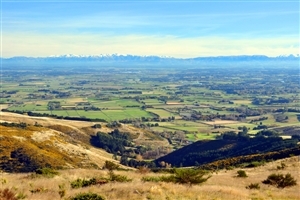 This morning, cross the patchwork farmlands of the Canterbury plains to the High Country. Travel to Lake Tekapo and visit the tiny Church of the Good Shepherd before entering Mt Cook National Park, home to Australasia’s highest mountain. Choose your activity from a visit to The Sir Edmund Hillary Alpine Centre, a guided nature walk or an evening star-gazing session. If you’re travelling during the summer months, board a MAC boat and get up close to spectacular icebergs on the Tasman Glacier Terminal Lake. Follow the shores of Lake Pukaki and the coastline to view the mysterious Moeraki Boulders. In the university city of Dunedin, known as the 'Edinburgh of the South', select your next touring activity. 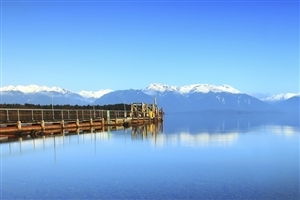 Travel through the rural Southland to peaceful Te Anau, nestled beside the second largest lake in New Zealand, its miles of uninhabited shoreline bordered by lush virgin forest. Explore an underground network of glowworm caves, learn about the beautiful landscapes of Fiordland, or select from the many activities onoffer today, with the rest of the day free to enjoy the lakeside tranquillity. Lush rainforest meets snow-capped mountains as you drive the spectacular Milford Road and cruise the full length of Milford Sound, spotting seals, dolphins and penguins. Continue to Queenstown. 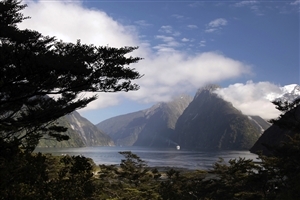 Your touring choices include visits to several local sites where the 'Lord of the Rings' trilogy was filmed or the chance to ride on the famous Shotover Jetboat. Select your own 'Dine around Dinner' option on your first night and then enjoy a full day at leisure to explore the 'adventure capital of the world'. Travel through the Kawarau Gorge, skirt the shores of Lakes Wanaka and Hawea, and then cross the Haast Pass with its spectacular views before entering Westland National Park and the Franz Josef Glacier. Enjoy the scenic drive to Hokitika, renowned for its crafted jade jewellery. Then, at the summit of Arthurs Pass, join the TranzAlpine Express through the Southern Alps - one of the world’s great train journeys. 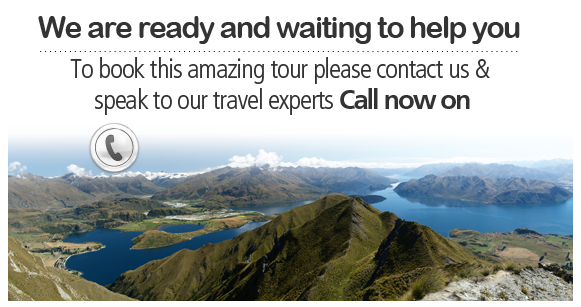 Travel the rugged east coast to Kaikoura and perhaps take an optional whale watching flight (own expense). Then it's on to Nelson where your next day touring choices showcase the wine and art of the region. 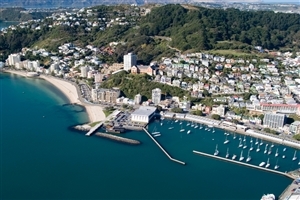 Travel the pretty Marlborough region and cross the Cook Strait by Interislander ferry to the vibrant capital city of Wellington. Tomorrow,choose to explore with either a city tour, a visit to Zealandia, a 'Lord of the Rings' tour or an exploration of the Carter Observatory and Planetarium. Today’s scenic drive brings you to Napier, centre of the Hawke’s Bay wine region. Take a guided Art Deco Walk then sample some of the country’s fine wines on a tasting tour at the New Zealand Wine Centre. En-route through the Esk Valley, stop in Taupo, set beside New Zealand’s largest lake. This evening, immerse yourself in traditional Maori culture with a hangi-style feast and performance of song and dance. Tomorrow’s touring options include an Agrodome sheep show, visit to Te Puia Thermal Reserve or a tour of Wai-O-Tapu hot springs and boiling mudpools. 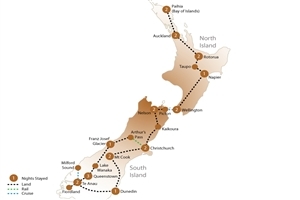 Via Auckland, follow the Pacific Ocean Drive through Whangarei to Paihia in the spectacular Bay of Islands. An area of outstanding beauty, it is also the birthplace of the nation with touring options to suit lovers of water, nature and history. Cruise by catamaran to Cape Brett and the famous Hole in the Rock and see dolphins and schools of fish. This afternoon, return to Auckland and your hotel in the heart of downtown. Your touring options today include a city sights tour plus a choice of one other: Waitemata Harbour cruise, Auckland Harbour Bridge climb, wilderness adventure, or a visit to the Auckland Museum, Kelly Tarlton’s Underwater World or Voyager Maritime Museum. This evening, enjoy a special farewell dinner. This morning your tour concludes with a transfer to the airport.